Finding a man is easy, because they are literally everywhere. But the real challenge here is finding a man who shares your values and interest, someone with a pleasant yet interesting personality. 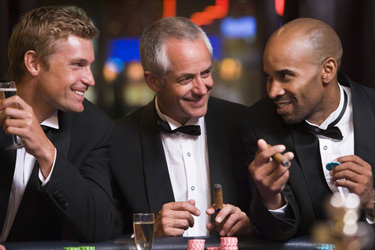 Knowing where eligible men hangout is a good start. Check out these best places where you can potentially meet nice single men. If you are looking for a man who you can share the same interest, then a class is a logical place to hunt. Many men take classes to advance their careers, increase business, and to learn more about a particular subject. So perhaps, you should consider enrolling in a continuing education course. For example, here are a list of classes that you just might find your Mr. Right: real estate, business, law, automobiles (mechanics and classic cars), investment, and accounting. Also consider registering for classes that are separate from your career and business. Try find a new hobby with lessons in courses such as art, golf, tennis, fitness, skiing, horseback riding, chess, and adventurous sports. We once had a client after our suggestion, sign up for comedy and acting classes. One day after the class she met an awesome guy. She approached him by commenting on how good his comedy routines were and ask them out for coffee. The rest is as we shall say history, the two are an item. This is the best time since this is election season. People who share the same political interests are often more likely to be compatible with each other. If you are looking for a man whom you can talk politics with, then you should head out to an organizational meeting and volunteer. While you will have so much fun, you will develop great friendships and connections that will be invaluable to you. There are interesting men in conventions and workshops who are just waiting to catch your eye. Most conventions are industry-related, so attending these events will help you find professional single men who belong to the same or similar industry as yours. These men are there to also widen their network, both professional and personal. Single men who want to further hone their skills also attend workshops and seminars. Choose those that tackle topics that men are most likely to attend such as film and photography, software programs, writing, management, leadership and the like. Also consider seminars and book signing by authors. These events receive a lot of publicity which means men who love to read will usually be there to meet their favorite author.